MR. COUGHLAN: May it please you, Sir. Before I call Mr. Ahern to give evidence, I would first of all just like to indicate, Sir, in the public interest, what the purpose of an outline or opening statement at a tribunal is. It is a statement indicating to the public, and any persons who may be affected by the evidence of the Tribunal, the work which the Tribunal has carried out in its private investigatory stage, the information which has been obtained, and which you have decided should be dealt with in public sittings and, in general, the way that evidence will be dealt with in public with reference to the lines of inquiry in general terms which will be pursued in public. It is not a statement of any conclusion which has been reached by the Tribunal because you, Sir, are the only one, at the end of the day, having heard all of the evidence and all appropriate submissions, who can find facts and arrive at any conclusions. Because of certain confusion which has arisen, I propose to deal in greater detail than I would ordinarily do in an outline statement with matters relating to the Tribunal’s dealings with the Fianna Fail Party in correspondence, primarily with its solicitor, in respect of the records kept by the Fianna Fail Party of the funds received at various general elections but with more specific reference to the 1989 general election. I should say that in opening this correspondence, I am not concluding that there was any deliberate withholding of information from the Tribunal but the facts need to be established in the public domain and it would be for you, Sir, as the Tribunal, at the end of the day, to make any findings of fact or to arrive at any conclusions which you consider appropriate in accordance with the Terms of Reference which you have been given for the purpose of this inquiry. On the 19th July 1989, the Tribunal wrote to Messrs Frank Ward & Co, solicitors for the Fianna Fail Party, in the following terms. “Dear Mr. Ward, I refer to previous correspondence in relation to your above-named client. I am now writing to you in relation to a separate matter on which the Tribunal is seeking the assistance of your client. “In the course of the private phase of its work, the Tribunal wishes to examine records of donations made to the Fianna Fail Party at any time between January 1979 and December 1996. The Tribunal’s intention in seeking to examine these records is to identify persons who have made sizable donations to the Party with a view to ascertaining whether such persons may also have made donations to Mr. Charles Haughey’s own election expenses or to any other fund which may have been operated by Mr. Haughey. “This request is being made in the course of the private phase of the Tribunal’s work when the Tribunal is engaged in the process of gathering evidence or information which may lead to evidence material to its Terms of Reference. These records will remain strictly confidential unless, in the absolute discretion of the Sole Member, they are or become relevant to the Tribunal’s Terms of Reference. “As the Tribunal is anxious to proceed with these aspects of inquiries, I would be obliged to hear from you at your earliest convenience and in the first instance you might telephone me to indicate when you might expect to be in a position to deal with this matter. Thank you for your letters of the 19th July, 21st July and 23rd July. On the 11th August 1999, solicitor to the Tribunal, together with junior counsel to the Tribunal, attended at the Fianna Fail Party Headquarters for the purpose of carrying out an inspection of the records. The only documents made available to junior counsel and solicitor to the Tribunal were the cash receipts book covering the various periods. These Cash Receipts Books contain a list of every donation to Fianna Fail for the various periods. No other records were made available for inspection by junior counsel and/or the solicitor to the Tribunal. Now, I pause there to emphasise that the Tribunal is not, at this stage, making a suggestion that there was a deliberate attempt to withhold information or documents from the Tribunal. But this is an outline statement and ultimately, Sir, it will be for you to deal with the matter. By letter dated 15th June 2000, Mr. Davis, solicitor to the Tribunal, wrote to Mr. Ward. I refer to previous correspondence in connection with your above-named clients. “You will recall that during the course of last summer, members of the Tribunal legal team attended at your client’s Head Office and examined your client’s original records of donations received in the years from 1980 to 1996. The Tribunal, as a matter of some urgency, wishes to obtain copies of your client’s records for the year 1989. “This request is being made in the course of the investigative phase of the Tribunal’s work and the copy records produced by your clients will remain strictly confidential unless in the absolute discretion of the Sole Member, they are or they become material to the Tribunal’s Terms of Reference. The letter of the 15th June from Mr. Davis to Mr. Ward seeking copies of the records of donations received in the year 1989 was prompted by information made available to the Tribunal’s lawyers by Mr. Mark Kavanagh’s lawyers that a significant donation, in the amounts described by Mr. Kavanagh in evidence here, had been made to Fianna Fail through Mr. Haughey. On Friday, 16th June, 2000 the Tribunal received, from the solicitors to the Fianna Fail Party or from Fianna Fail, a copy of the Cash Receipts Book to which access, but not copies, had been furnished in the previous summer at Fianna Fail Headquarters. The Tribunal noted anonymous donations of £25,000 and £50,000 and a further donation which was designated as being anonymous in the sum of £50,000 which has not formed part of the public sittings of this Tribunal. The Cash Receipts Book or the copy of the Cash Receipts Book furnished did not indicate to the Tribunal that there had been a donation recorded as being received from Mr. Mark Kavanagh. As I indicated in earlier my outline statement, the Tribunal had also checked to see if £25,000 had been received in the Party Leader’s Allowance account in AIB, Baggot Street for the purpose of the Brian Lenihan fund and it appeared to the Tribunal that it had not been so received. On Monday the 19th June, the Tribunal’s lawyers met with solicitors acting for Fianna Fail and with Mr. Sean Fleming. At that meeting – and I should stress it was not Mr. Fleming – Fianna Fail made available what the Tribunal has described as the second list and which Mr. Fleming has described as the extract from the Cash Receipts Book. Looking at that document, the Tribunal could see that Mr. Mark Kavanagh was identified as being the anonymous donor of £25,000 recorded in the Cash Receipts Book and there was also furnished to the Tribunal at that meeting a copy of the Custom House Docks Development Company cheque in the sum of £25,000. That copy had been made by Mr. Fleming in 1989 and formed part of the records of Fianna Fail and was retained at Fianna Fail Party Headquarters. I refer to the meeting yesterday with Mr. Sean Fleming and members of the Tribunal legal team. Arising from the meeting, I am writing to advise you that the Tribunal would wish to hear further evidence from Mr. Fleming in the course of its resumed public sittings which are due to commence on Tuesday next, 27th June 2000. My purpose in writing to you is to request that Mr. Fleming provide the Tribunal with a statement or Memorandum of Evidence which would deal with all of his information and knowledge, direct or indirect, regarding the matters raised in the course of yesterday’s meeting. In order to assist Mr. Fleming in the preparation of his memorandum, I would suggest that Mr. Fleming should include reference to the matters listed in the schedule appended to this letter. “As the Tribunal is under an obligation to circulate statements or memoranda of evidence to persons who may be affected prior to such evidence being led in public sittings, I would be obliged if you would let me have Mr. Fleming’s statement or memorandum by no later than the close of business Thursday next, 22nd June 2000. 1: Mr. Fleming’s role in relation to the records kept by Fianna Fail of election fund receipts in 1989. 2: A full description of the system of recording the information contained in the records, the documents or copy documents retained and the manner in which donations were receipted. 3: The circumstances in which certain donations in the records kept for 1989 were described as “anonymous”. 4: Details of all records kept by Mr. Fleming or by the Fianna Fail Party of the anonymous donations. 5: Mr. Fleming’s knowledge, direct or indirect, of the identity of the donor of donation reference number 4632 for £25,000 recorded as being received on the 15th June 1989 and marked “anonymous”. 6: The circumstances in which the person from whom the donation was received and the source of Mr. Fleming’s knowledge as to the identity of the donor. 7: Whether Mr. Fleming or any other person on behalf of Fianna Fail issued a receipt for such donation and if so, to whom the receipt was issued and the person to whom it was delivered. 8: Mr. Fleming’s knowledge, direct or indirect, of the identity of the donor of donation reference 4631 for £50,000 which was recorded as received on 15th June 1989 and was also marked “anonymous”. 9: The circumstances in which and the person from whom the donation was received and the source of Mr. Fleming’s knowledge as to the identity of the donor. 10: Whether Mr. Fleming or any other person on behalf of Fianna Fail issued a receipt for such donation and if so, to whom the receipt was issued and the person or agency to whom it was delivered. 11: Mr. Fleming’s knowledge, direct or indirect, of the identity of the donor of donation reference number 4752 for £50,000 which was recorded as received on the 3rd July 1989 and was marked “anonymous”. 12: The circumstances in which the person from whom the donation was received and the source of Mr. Fleming’s knowledge as to the identity of the donor. 13: Whether Mr. Fleming or any other person on behalf of Fianna Fail issued a receipt for such a donation and if so, to whom the receipt was issued and the person or agency to whom it was delivered. The Tribunal received a letter from Messrs Frank Ward & Company dated 21st June 2000. Messrs Frank Ward & Company then refer to a matter which has not been led in public and I will not deal with here. The letter goes to refer to other enclosures as follows: “2. Copy receipt 4632 dated 15th June 1989 of anonymous donation of £25,000 and the donor was Mr. Mark Kavanagh. 3: Copy extract from AIB statement Fianna Fail No. 4 Election Account showing lodgment of £75,000 relating to the above two contributions. 4: Copy receipt 4752 dated 3rd July 1989 anonymous donation of £50,000. Donor: Mr. Michael Smurfit. The receipts and the extracts from the bank statements have already been dealt with in the evidence of Mr. Fleming over the last day or two. By this stage, the Tribunal had information showing who the donors were in the Cash Receipts Book for the 1989 general election. It had, as of Monday 19th June, the second list or extract and the backing documentation, namely photocopies of the £25,000 cheque from Mr. Kavanagh and the photocopy of a bank draft for £50,000, made payable to cash, drawn on Guinness & Mahon, and attributed to the anonymously recorded donation of Mr. Michael Smurfit in the Cash Receipts Book. By this correspondence received from Messrs Frank Ward & Company, the Tribunal also had copies of the receipts which had been sent to Mr. Haughey by Mr. Fleming’s office. Enclosed herewith please find copy fax as received by my client just after midday today. As this would appear to relate directly to our discussion with Mr. Sean Fleming of last Monday and a statement I am in the process of preparing on his behalf, I would be obliged to hear from you. Enclosed with that letter was a copy of a facsimile transmission to the Fianna Fail party from Ms. Ursula Halligan, TV3, political correspondent. It was addressed to the Fianna Fail Press Office, it’s dated 22nd June, and it reads: “TV3 has been informed that in 1996/early 1997, a senior party figure informed the Taoiseach that a sum in the region of £100,000 for Fianna Fail given by the property developer Mark Kavanagh to Charles Haughey in 1989 was not passed onto the party in full. 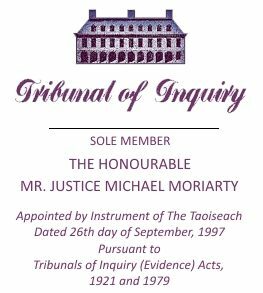 “Why didn’t the Taoiseach tell the Moriarty Tribunal that he was made aware of this information? The portion of that facsimile transmission which would have been of interest to the Tribunal was that there may have been an earlier inquiry in respect of Mr. Mark Kavanagh’s failure to receive a receipt or an acknowledgment in 1996. The Tribunal knows nothing about that portion of Ms. Halligan’s query relating to whether or not Mr. Charles Haughey had passed on the contribution in full to the Party nor whether a query was raised about that. The information given to the Tribunal is that a query was raised and evidence has been led from Mr. Eoin Ryan that a query was raised in respect of failure to provide an acknowledgment or a receipt. With reference to our meeting in your office on the 19th instant, your letter of the 20th instant, and our subsequent telephone conversations, I am now pleased to enclose a statement of Mr. Sean Fleming as requested, together with copy documents as set forth in the appendices thereto. “Clearly such statement deals with two contributions, (reference numbers 4631 and 4752) which have no obvious connection with the contribution made by Mr. Mark Kavanagh. It is a matter for the Tribunal as to how it will deal with the identity of these contributors in the course of its public sittings. On the morning of Friday, 24th June, the Tribunal learned for the first time through media comment that Mr. Eoin Ryan may have been the senior Fianna Fail figure referred to in the query raised by Ms. Halligan. The Tribunal immediately communicated with Mr. Eoin Ryan who responded by return on the same day. “I refer to my letter to you on the 23rd June last concerning a report in the Irish Times of that date. “I am now writing to you to bring to your attention certain further information which has come to the Tribunal concerning this matter. Mr. Eoin Ryan SC has informed the Tribunal that the reports contained in the Irish Times of the 23rd June 2000 are generally correct. He has also informed the Tribunal that he was asked to make contact with Mr. Mark Kavanagh in 1996 regarding a contribution to the Fianna Fail funds. Mr. Mark Kavanagh indicated to Mr. Ryan that he was disposed towards making a contribution to the Party but that he had received no acknowledgment for an earlier contribution and that this was a source of some annoyance to him. While Mr. Ryan is not sure whether Mr. Kavanagh mentioned a specific figure, he formed the impression that the contribution involved was a substantial one. “Mr. Ryan has informed the Tribunal that following this contact with Mr. Kavanagh, he went to see the Taoiseach Mr. Ahern and that he informed Mr. Ahern of his meeting with Mr. Kavanagh. Mr. Ahern’s response was to say that he would look into the matter. Mr. Ryan then contacted Mr. Kavanagh’s office to inform Mr. Kavanagh’s office that the matter had been brought to Mr. Ahern’s attention and that Mr. Ahern was looking into it. “Mr. Ryan has indicated to the Tribunal that he had no further conversation with Mr. Ahern in relation to the matter. 1: Did Mr. Ahern make any inquiries on foot of the information relayed to him by Mr. Ryan and if so, give full and detailed particulars of those inquiries. 2: Furnish a full and detailed account of the result of those inquiries. 3: Did Mr. Ahern make contact with Mr. Mark Kavanagh and if so, did he bring to Mr. Kavanagh’s attention the results of any inquiries he put in place? 4: Identify each and every person with whom Mr. Ahern discussed or may have discussed this matter, together with details of any such discussions. 5: Furnish full and detailed particulars of any contacts Mr. Ahern has had with Mr. Mark Kavanagh or with any other person concerning this matter at any time since Mr. Kavanagh made the contribution in question in June 1989. 6: Please indicate whether your client has any information, direct or indirect, concerning any other payment intended for Fianna Fail but which was not actually received by the party. CHAIRMAN: Whilst it’s only a point of detail, Mr. Coughlan, I think it’s acknowledged that the Tribunal letter was in error in that Mr. Ahern was opposition leader rather than Taoiseach at the time. “It would be much obliged if you would kindly arrange for Mr. Sean Fleming to provide the Tribunal with a statement of his knowledge, direct or indirect, of any queries raised either by an Taoiseach, Mr. Bertie Ahern, or by Mr. Eoin Ryan at any time since June 1989 concerning a donation made by Mr. Mark Kavanagh to Fianna Fail at that time. By letter dated 26th June 2000, Messrs Frank Ward & Company wrote to Mr. Davis and transmitted by a facsimile, at 19.38 Re: Mr. Sean Fleming. Previous correspondence herein refers. I enclose herewith a signed statement of my client which is, you will note, a faxed copy. The original will be available tomorrow. This enclosed the second statement of Mr. Fleming dealing with the matters which the Tribunal requested him to deal with in the letter of the 23rd June. The failure to get all records, that is all records other than the Cash Receipts Book, may have been through inadvertence but that is a matter to be inquired into. That dates from last year. A second matter is the matter which I took up with Mr. Fleming in the course of his evidence that the Tribunal did not become aware of the 1996 inquiry until the matter broke in the media on Thursday of last week, notwithstanding that on the previous Monday, the Tribunal had made information available to Fianna Fail and to Mr. Fleming that Mr. Kavanagh had informed the Tribunal that his company had made a contribution to the Fianna Fail Party directly to Mr. Charles Haughey by way of a cheque made payable to £25,000 and three bank drafts made payable to £25,000 made payable to cash. Again, I stress, Sir, that these are matters to be inquired into and my outline on them here is to indicate to the public and to persons who may be affected by the work of the Tribunal, that they are relevant to the Tribunal’s line of inquiry and those lines of inquiry would be pursued in public at the Tribunal.